head to the market on animal feet. First comes a mouse. He's a ratón. Número uno, out on his own. " 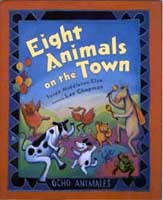 Eight Animals on the Town rhymes, with 30 Spanish words sprinkled throughout the story of eight animals on their way to the market. Each animal buys something to eat. The mouse buys cheese, the cat buys milk, etc. After they shop, they eat supper and head downtown to the dance. Then they drive home in two cars. The ethnic art is very comical. Wait until you see the horse! Illustrations on this page are copyrighted by Lee Chapman 2000. This bright, clever picture book . . . stands out because of its seamless instruction in Spanish and English, which is apparent in both text and illustrations . . . This is an engaging choice for early readers. A rhyming romp that introduces readers to numbers and vocabulary in Spanish . . . the text has wit and whimsy, the illustrations are absolutely delectable. A rewarding choice for reading aloud or for poring over pictures. A charming rhyming book in "Spanglish" about eight animals who dine and dance on the town. "Número cinco is a young frog/fifth in line behind Bird and Dog. Frog hops along, hungry for flies. 'Moscas,' says Rana, 'economy size.' " Chapman's high-spirited oils on canvas accompany the ocho animales.